Thank you to these shops for collaborating with me on this fun post and gifting some product for review. As always all thoughts and opinions are 100% my own. Izzy’s Nana, my mother, means so much to her and our family. 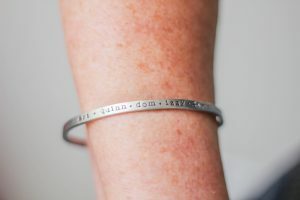 So when it’s grandparents day, her birthday or any special occasion where we celebrate her, we love to find gifts that will being joy to her and are generally personalized. Every grandparent has their “name”. Meme, Mema, Nana, Grammy… the list goes on. 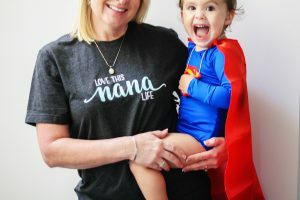 I was pumped to find a Nana shirt at Mom Life Must Haves. It speaks the truth, because man does she love that Nana life! My mom is an amazing mother, I’m super lucky. She’s also a rockstar Nana too! She’s got 4 grandsons and 1 granddaughter (Izzy). Chic Mama Jewelry has very gorgeous customizable pieces! You will for sure find a style that matches your mother or mother in law. I love this bracelet and how we could fit all of the grandkids on it. The quality is amazing and my mom loves it so much, she wears it daily. All the grandchild chasing and traveling/driving to see their grand babies, every grandma need an on the go mug. 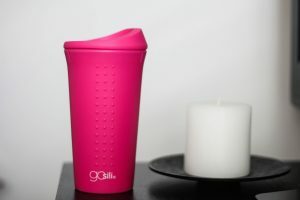 These new mugs from go sili are amazing. There are so many colors to chose from and you can also mix and match them. I have some of their kids cups for Izzy and when the adult ones came out I had to jump on them! 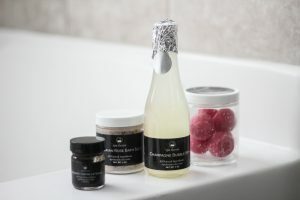 Lastly, but certainly not least bubble bath goodies! Doesn’t matter how old you get, nothing beats a bubble bath and Grandma will need it after a busy day chasing and playing with your kid(s). Spa Thyme has some amazing products that are “gourmet food for your body.” Her skin will love these fun, adorable and quality products. Have fun shopping for the grandma in your life! Very thoughtful gifts. Any grandmother would love these items! These are awesome gifts for grandma! I know my mom would love the bath salts! Yas! Who doesn’t love a relaxing bath? My mom would love that bracelet! My mom would love these goodies! I love that Nana shirt too! who wouldn’t love the good bubble bath stuff. I know thats what I would want right now.